The luxurious Aquamare is first and foremost a spa hotel which aims to offer an experience of rest and relaxation. It was very quiet when we were there . It has a lovely indoor pool but the you have to use the changing rooms in the gym which is away from the pool not ideal. Lovely pool outside but too cold in Jan. The food was excellent and the rooms good we had a sea view. Staff were helpful and pleasant. It's about a 15 min walk to the nearest resturants, bus stop about 5 mins down the road. Nothing bad to write about this hotel. 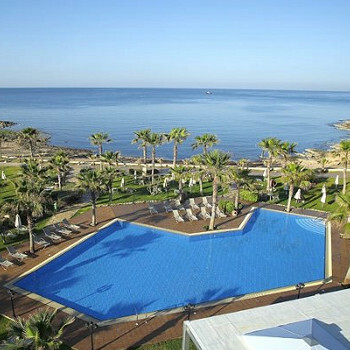 The Aquamare is an almost new hotel, located a fair distance out of Paphos.There are spa facilities although we did not use them, and indoor and outdoor pools. It is quite a pleasant walk along the coast into the town, but it takes about 40 mins. We had a nice sized room as it was on a corner, very nice decor, tea and coffee making facilities, nice bathroom, hairdryer, free safe. I would reccommend a sea view room , we had inland view and whilst the actual view was pleasant, there was a lot of noise from the road. The food was pretty good overall, particularly the breakfast and the desserts in the evening. We found the staff polite and helpful, particularly in the bar. No problems at all and we had a very pleasant week with excellent weather. The building work in the harbour area is nearly finished , so by now people will be able to walk right along. The harbour is a great place to sit with a beer or coffee and watch the world go by. Don't miss the mosaics near the harbour if you are interested in history, and trips to Kourion and Kyrenia.